The National Board Incident Report provides documented statistics of pressure equipment accidents that have occurred across the United States. The data is collected from the Occupational Safety and Health Administration’s (OSHA) public website database, “Fatality and Catastrophe Investigation Summaries.” OSHA’s resources were chosen due to its decades-long, credible reports of on-the-job accidents. The Incident Report is a look back at accidents that have already occurred. Analysis of accident data can reveal causes and trends in pressure equipment incidents and can provide insight that may be valuable in preventing future accidents. National Board extracts reports from OSHA’s database using industry-specific keywords to customize the results. Each customized report generated by OSHA is then reviewed by National Board staff. Only incidents that are identified as applicable to the boiler and pressure vessel industry are added to the Incident Report statistics. Before OSHA reports are cleared and posted to its database, each summary undergoes a thorough investigation, revision, and screening process by OSHA, which can delay posting up to 5 years. For those reasons, the National Board has elected to research summaries that are greater than five years old. The 2015 Incident Report includes OSHA summaries that have been updated and cleared by OSHA as of 12/31/2015 for occurrences through 12/31/2010. 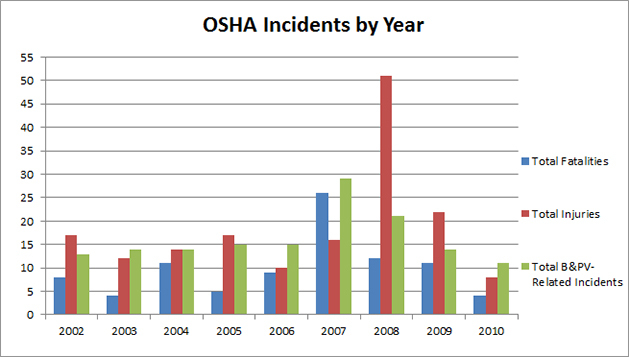 The 2010 OSHA summaries are the newest set of data National Board has reviewed and added to the Incident Report. To view the customized summary reports, click on the following "OSHA Incidents" links.